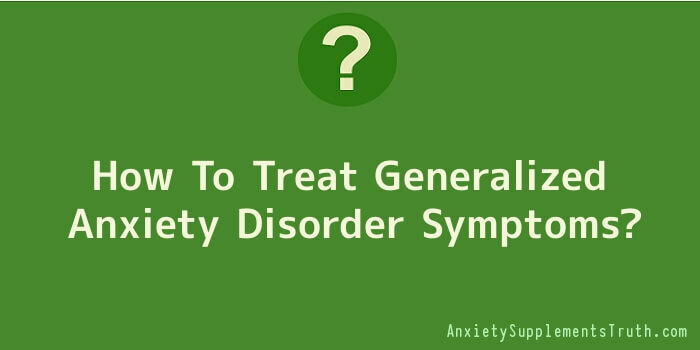 How To Treat Generalized Anxiety Disorder Symptoms? If you suffer from generalized anxiety disorder symptoms, then one of the biggest questions is without a doubt how you can get rid of it. Well, though it is not possible to simply repeat a mantra over and over again and cast it out of your system, you can at least take heart in the fact that there are plenty of things you can do to help yourself deal with and cope with your symptoms on a daily basis. Medication is almost always prescribed to work in conjunction with any therapy programs you might embark upon after diagnosis. The type and severity of the medication varies greatly depending on the individual person, their physical size and the depth of their suffering. It is important to be as open and honest with your physician as possible – sometimes, extended periods of hard stress can invoke symptoms similar to panic attacks. You don’t want to medicate yourself if you don’t have to. It’s also important to note that you might perceive your symptoms as being simply an anxiety disorder, but many times your anxiety piggybacks on a more pressing problem or conflict within yourself that must be dealt with before any amount of therapy can do you any good. If you have ever been on a therapy program or medicated for anxiety before, it is also vital that your doctor knows your entire treatment history, including whether it was ultimately beneficial or if it failed. If you’re going to undergo another period of treatment, you have to commit yourself to it 100% and push yourself to do exactly what the doctor and therapist say, regardless of whether it will make you feel uncomfortable or not. Before deeming any one treatment as a failure, make sure you give it enough time to settle into your psyche and help you. Anxiety is not something you’re going to cure in a week or a month or even a year. It’s going to be a long term goal and the treatment should be respected with that same mindset. Likewise, use your medication exactly as prescribed and above all else do not stop taking your medication before your doctor tells you to stop. Many of these drugs take some time for your body to adjust and regulate itself properly. For example, one popular type of medication to treat anxiety is actually an antidepressant. While typically used to help depression, antidepressants also treat anxiety very well. The only catch is it will take at least four to six weeks before your symptoms will start to go away.